Kōfuku-ji (Japanese: 興福寺) is a Buddhist temple in the city of Nara, in Nara Prefecture, Japan. The head temple of the Hossō sect, it traces its origin to the Yamashina quarter of Kyoto. 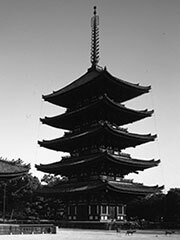 That temple was moved first to Fujiwara, and then to the permanent capital at Nara at the beginning of the Nara period in 710. Kōfuku-ji, along with several Buddhist temples, Shinto shrines, the remains of the Heijō Palace, and other sites in Nara, received the distinction of being named a UNESCO World Heritage Site.